I heard this sentiment from several readers. Contrary to your last poster, I thought Metro did a pretty good job with Sandy. I think it was a good idea to stay open until closing on Sunday, for example. Also, the alerts they sent out were good, except for a few I got about 10 times in a row. Thank god I have unlimited texting. Since I have no car, I was also very happy to see Metro open up yesterday at 2. It's got to be hard to stop and start a system like that. I was pretty pleased with Metro until I read MTA in New York was waiving all fares yesterday. Ugh. Really? 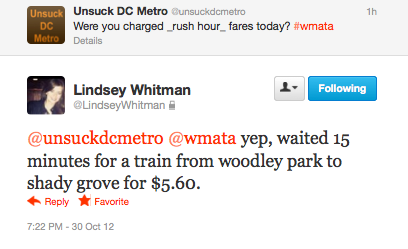 Not even weekend fares for weekend service? Yeah, DC didn't get hit quite as much, but I think Metro could have at least made a gesture to the few people who were going out to ride today and waived fares. What a PR win that would have been. Another missed chance for Metro. I guess you have to take the good with the bad, but for me, this washes all the good away.